1. There's an excellent review of the 1:48 Trumpeter / MiniHobbyModels Mi-24 kits, including a detailed part-by-part comparison with the Revell - Monogram kits, at PMMS. 4. Having now had the opportunity to examine the new Zvezda 1:72 Ka-52 Alligator #7224 (HKN #143) and Mi-8T #7230 (HKN #148) for myself, I can confirm previous reports that the moulding of these kits is mostly excellent, and that the decals are sadly inadequate for kits of this quality. The Ka-52 moulding is considerably better than Italeri's, and the Mi-8 is of course in a different league when compared with the old KP kit. It appears that the various Ciro Mi-8 conversions originally made for the KP kit will fit into the Zvezda without any significant problems. The Mi-8 is available in the US from Linden Hill. It is interesting to note that the Ka-52 box that I received carries the words: "WARNING! Any sales of this kit outside the former USSR are illegal". I suspect that this is because my example came in the same box that was formerly used for Zvezda's licenced production of the Italeri plastic. It should be available worldwide in a revised box. 5. To clarify the information in HKN #146 about the 1:72 Gran' Mi-1, this kit makes the versions of the Mi-1 with the flattened upper nose surface and the diagonal cockpit windows, whereas the earlier MPM / WK and Amodel kits make versions with the rounded upper nose surface and the square cockpit windows. I would emphasise that the moulding quality is really very good, this does not look at all like a 'limited run' kit. I'm not sure that it's actually available for sale anywhere yet. 6. Maquette have released a 1:72 Ka-60 #MQ-7254 that appears (from a very quick examination) to be the same moulding as the Amodel kit, and not very tempting at all. I can't help wondering whether Amodel are passing their limited-run moulds to Maquette when they've finished with them ? 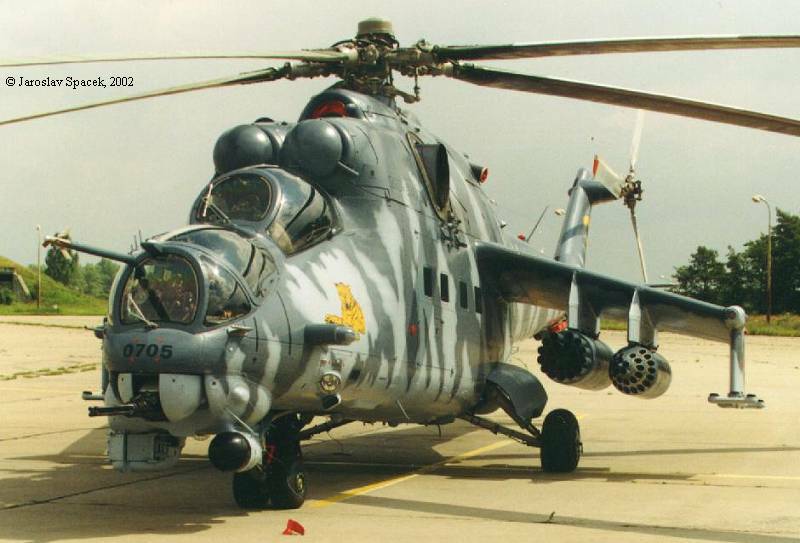 The new Zvezda/Berkut Ka-60 should be much better when it arrives. 7. Hasegawa's UK Army Air Corps version of their 1:48 Apache, the WAH-64D 'Royal Army', has now been released outside Japan, #09431. 9. Revell's reissued 1:48 H-53 #4446 is now available. On the box it's called "CH-53 GS/G Camouflage". 10. 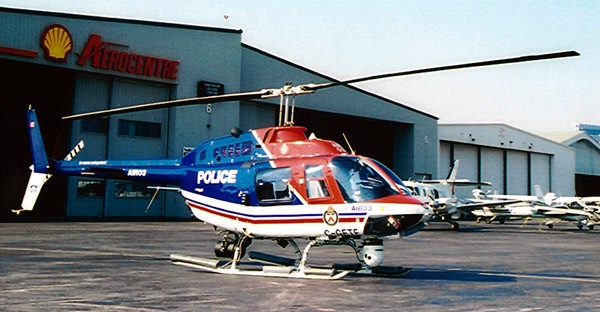 The JBOT Decals website is becoming a useful reference source for pictures of Canadian Police helicopters, among others. 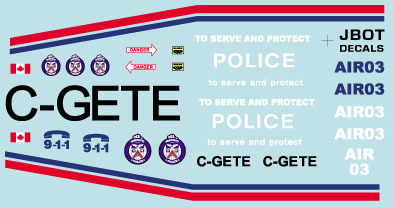 Their decals are available to order in a wide variety of sizes to match the popular scales for both aircraft and emergency vehicles, check the website for details. 11. Updating the information about the Belcher Bits CAF Chinook/Labrador/Voyageur decal sheet BD11 published in HKN #137, there are instructions and decals for three different schemes for the CH-147 Chinook, three for the Labrador, three for the Voyageur, and three for the Voyageur SARCUP, with enough numbers to mark up almost any chosen aircraft. However, the quantity of each different decal provided means that from one sheet you can make just one Chinook and one Labrador or Voyageur, your choice. 12. 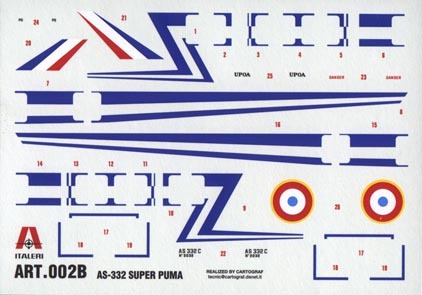 The short-fuselage Italeri 1:72 Super Puma #002 says on it's box that it has decals for France, Spain, and Brazil, but when you look inside you find only markings for Spain and Brazil. Most of us accepted this as another of Italeri's characteristic mistakes, and so it was in a way, but perhaps not quite how you might expect. One of HKN's readers wrote to Italeri asking where his French decals were, and eventually received in reply a supplementary decal sheet and instruction sheet ! 13. Model Art's decal sheet #72/042 is now scheduled for release at the beginning of August, this includes several Commando HC.4 schemes as detailed in HKN #145. I'm told that Model Art #72/041 (H-19's and Whirlwinds) is now completely sold out, so be warned and act accordingly. 14. Cobra Company will release the following at the 2002 USA IPMS Nats, which are under way right now. 16. Great Models Webstore now have pictures of almost all the 340 or more engines in the 'Engine & Things' range, so you can now take a look and make sure just which of their many options is suitable for your project. 18. 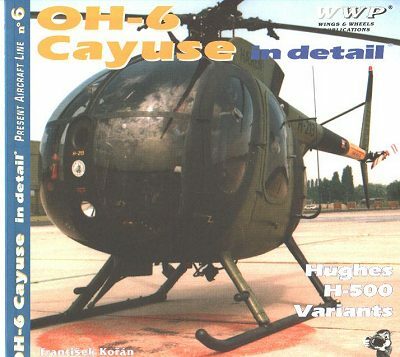 The latest publication from Wings & Wheels is #6 in their 'Blue Series', entitled 'OH-6 Cayuse In Detail - Hughes H-500 Variants', by Frantisek Koran and Jaroslav Spacek, ISBN 80-86416-21-6. If the book is as comprehensive as their previous titles, this one should be a real treat - this publisher seems to understand the needs of modellers better than any other, and at least one of the authors is himself a modeller (as well as being a Czech AF Hind pilot). Thanks to Jaroslav Spacek, Terry Ashley (PMMS), Jim Botaitis (JBOT), Yevgeny Borissov (Heliborne), Chris Miller (Cobra Company), Roger Evans (Whirlybits), Aksenov Dima, and Philippe Dognon (Kits Discount).